Overlooked by a bigger neighbour, passed on by its owners and about to be sidelined by the road network - it's not clear what the plan for this place is. The main building as a Little Chef. Widely known as Huntingdon services, this site is located on the eastbound side of the A14 Fenstanton Bypass, within junction 27. The entrance is direct from the road and the exit leads to the old road. There are currently major works to divert the A14 away from this area, which will leave the services with little passing traffic. It's not clear what the plan will be, but it will probably continue to serve local residents. 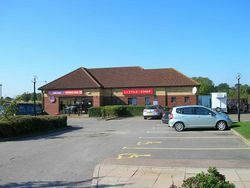 In 1989 the site opened as the common combination of a forecourt, motel and Little ChefHistory - known as the Huntingdon branch. It was later painted in blue by Forte in an attempt to attract more formal diners in the evening. When Granada took over they undid this, but they kept the furniture and introduced a Burger King franchise. In 2006 a Coffee Tempo! was added, but in 2012 it became a Little Chef Express. The amenity building was taken over by Euro Garages in 2017, who were forced to change Little Chef's name to EG Diner. 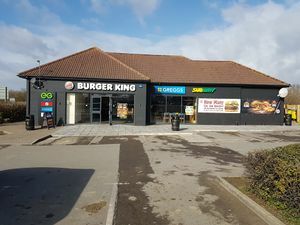 The EG Diner and Burger King both closed in summer 2018 for refurbishment and later reopened as a Burger King, Subway and Greggs combination site.